Heat a large skillet over medium-high heat. Add oil to pan; swirl to coat. Sprinkle chicken evenly with 1/8 teaspoon salt and pepper. Add chicken to pan; sauté 6 minutes on each side or until done. Remove from pan; let stand 5 minutes. Slice. ***You can always use 1-2 rotisserie chickens instead. Combine remaining 1/8 teaspoon salt, juice, mayonnaise, and avocado in a small bowl; stir until well blended. Spread about 3 TBSP avocado mixture over each bread slice. 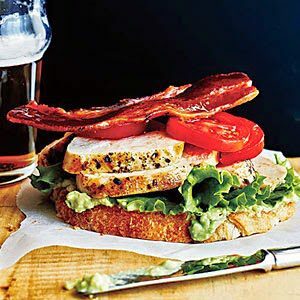 Top each sandwich with 1 lettuce leaf, 1 chicken breast half, 3 tomato slices, and 1 bacon slice. And you can top with another slice of bread if you’d prefer, and then slice the sandwiches in halves or fourths for the party.